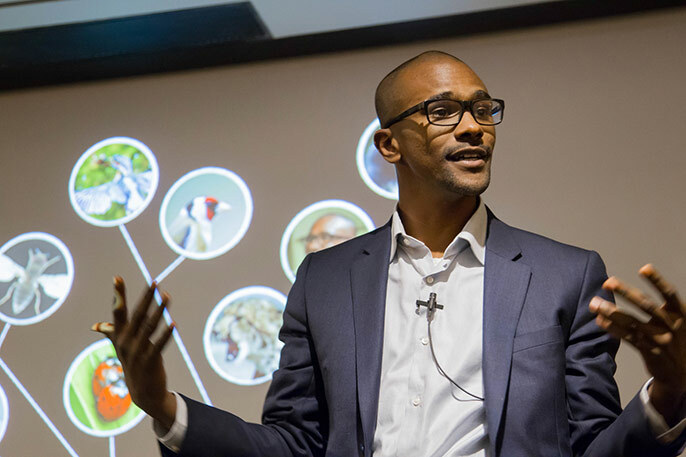 UCSF neuroscience grad student Sama Ahmed, whose three-minute talk on "how to know your species" won first place at the campuswide contest, will compete for the Grad Slam championship in Oakland May 4. Rules: Contestants may come from any academic discipline, but they must currently be enrolled as a UC graduate student. Judges will evaluate how well contestants engage the audience, the clarity of their research concepts, and how effectively they focus and present their ideas within three minutes. Social media: Follow and use #gradslam. Imagine spending years toiling over your doctoral thesis. Now, after long days in the lab and library, you have three minutes to explain your work to a roomful of strangers. Sound tough? Welcome to UC's Grad Slam, a spirited contest that challenges graduate students from across the University of California to summarize their research in just three minutes — and in a way that captivates and enlightens an audience. Think of it as a TED-talk on steroids, or the ultimate in elevator pitches. Squaring off in this first-ever UC-wide communications competition are the 10 reigning champions of campus-based Grad Slams held throughout 2014-15 across the university. The public event will be live-streamed May 4 from 11 a.m.-1:30 p.m. at www.universityofcalifornia.edu/grad-slam. "Researchers need to know how to discuss complex ideas and explain their work to the general public," said Pamela D. Jennings, director of graduate studies at UC's Office of the President, which is hosting the event. "This competition is a great way to help students sharpen their presentation skills and think creatively and strategically about how to connect an audience to their work." The top three contestants will take home bragging rights, a total of $10,000 in prize money and the smug knowledge that they can communicate esoteric research in a way that anyone can understand. UC President Janet Napolitano will emcee the competition and a distinguished panel of judges drawn from media, government and higher education will pick the winners. Altogether, Grad Slam contests on UC campuses have drawn hundreds of grad student entrants. Although just 10 of UC's 50,000 graduate students will face off for the final contest, campus grad slam competitions have become an effective avenue through which students are offered training on presentation skills and communication strategies. Generally, campuses have been beefing up professional development opportunities and public speaking workshops in recognition that all students, regardless of discipline, need to be able to explain the value of their research to people from outside their field of study. "Being able to communicate effectively gives researchers an edge when it comes to grant funding, landing a job, and talking to the media. It's become an essential skill," Jennings said. "And the competitions themselves give the public an entertaining way to learn about the breadth of interesting research going on across the university."